OceanLED, the renown marine lighting manufacturer has just launched the new improved version of the M6 Mast Light Gen2. 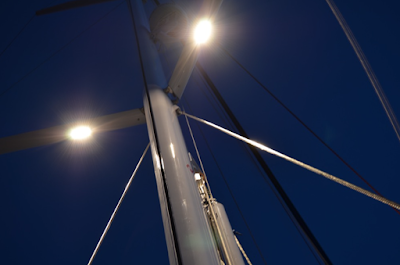 The new product is 50% more brighter, has improved design and a narrow angle beam to focus on the deck areas that you need more illumination on. PR follows. 6th June, 2017 OceanLED, the global leader in marine LED lighting, launches the new improved M6 Mast Light Gen2. 50% brighter than its previous model and an improved design, the M6 Gen2 has a narrow beam angle to help focus the powerful LEDs, making It perfect for illuminating your spreaders, beams and rigging. “The M6 has proved a popular model with our customers and we have increased the output to 660 fixture lumens with the new Gen2 model, whilst maintaining the same screw holes for easy upgrading” says Charles Stuart, Managing Director of OceanLED. Simple to install with only a small ½” hole required to feed through the cable and 2 screws. It has OceanLED’s active thermal control to prevent overheating and is easy to clean thanks to its Tritonium coated lens. Available in either ultra white or warm white. OceanLED is the most innovative and widely used marine lighting brand in the world. The UK based company’s product line serves a multitude of uses on board all sizes of boats, from 3 meter RIBs to the largest of superyachts. Continuing projects at some of the world’s most prestigious boat yards and boat builders, along with a loyal dealer network across the globe, are testament to OceanLED's advanced technical achievements, industry recognition and constant pursuit of excellence in the field of marine lighting. For more information about OceanLED call (+44) 01455 637505, or in the U.S. at (954) 523-2250. To learn more about OceanLED’s world-renowned underwater LED lighting, visit www.oceanled.com.